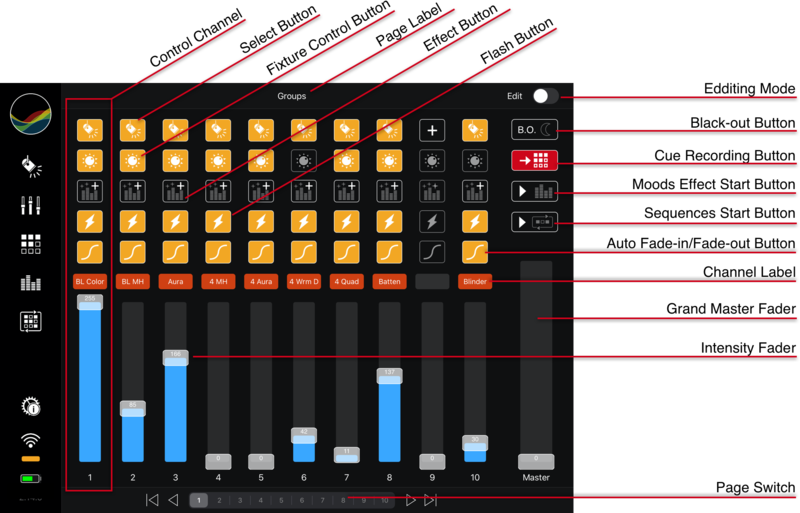 The StageLight mixing interface shows 8 Control Channels (or 12 Control Channels on the iPad with 12,9" display). Each of them controls one fixture with all its characteristics (e.g. master, color, pan, tilt, ...) or a group of fixtures. 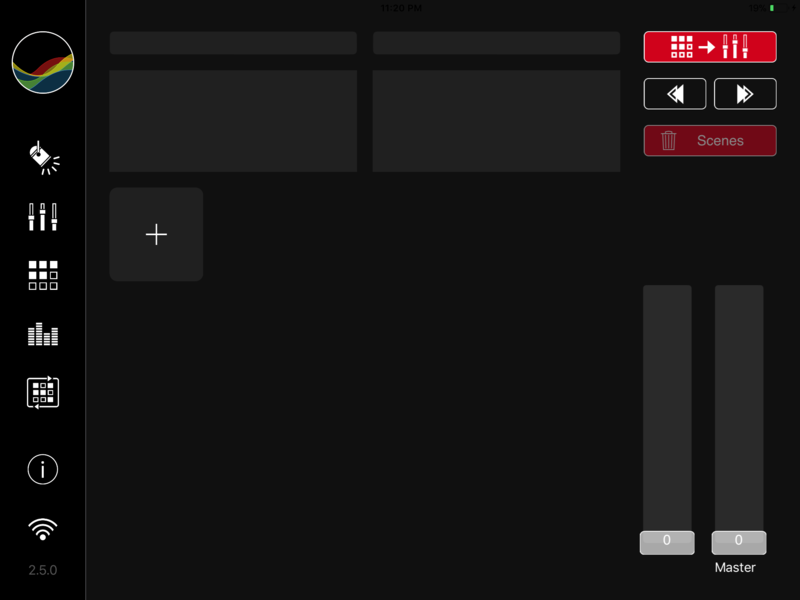 With the Control Channel Switch you can select 6 areas each with 8 Control Channels (or each with 12 Control Channels on the iPad with 12,9" display). 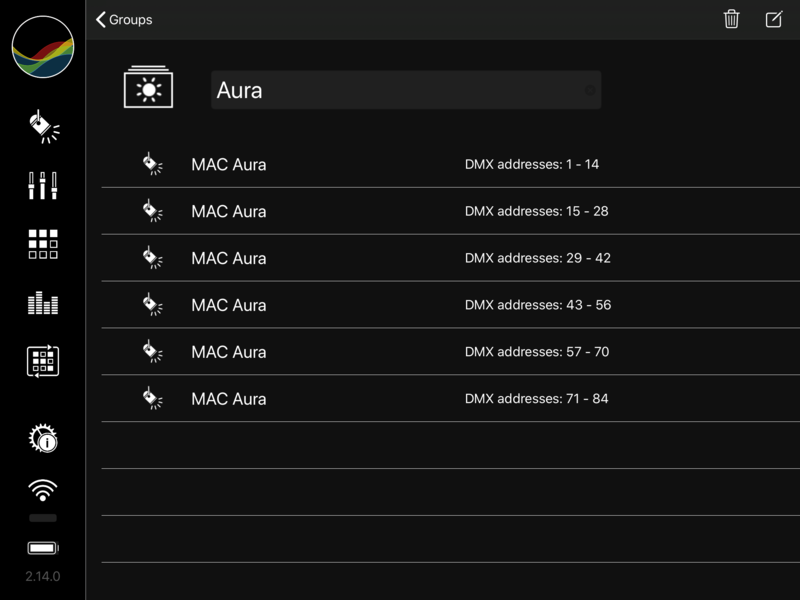 So you can control a maximum of 48/72 single fixtures depending on your device. Each control channel has a Channel Master Fader, a Select Fixture Button, a Fixture Control Button, a Effect Button and a Flash Button. When you first entering the app the Channel Master Fader and all buttons (apart from the Select Fixture Button) are inactive. The various channel features become active when you assign a fixture to the channel. The buttons and faders that do become active depend on the characteristics of the fixture (i.e., which dmx channel types it has). Opens a dialog to assign a fixture or a group to a control channel. This button opens a dialog to adjust all control attributes of the corresponding fixture or a group of fixtures (e.g. a specific program). If the fixture has only a DMX master channel this button is inactive. Select a fixture or group to the 1-8 effect output channel. See the chapter "Working with Effects" for more details. Press this button to bring a single fixture or a group to full intensity. 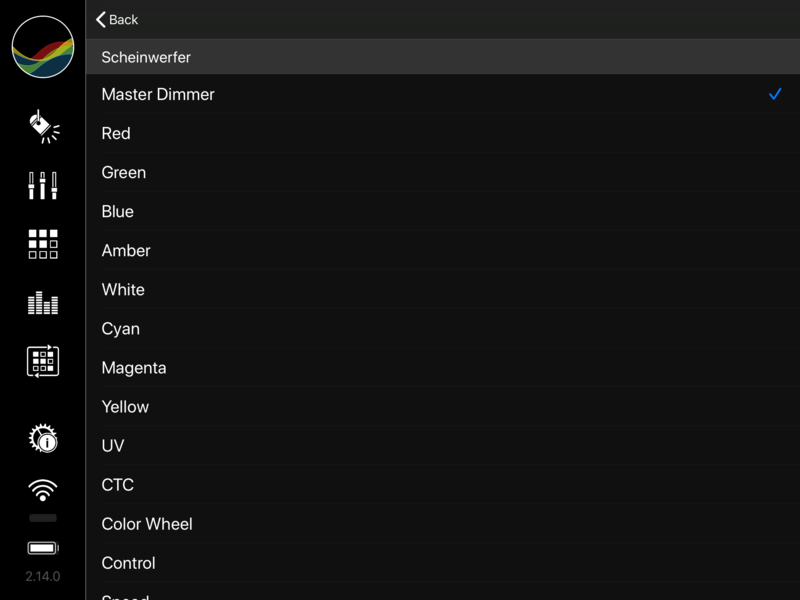 The Channel Master Fader controls the master output of the corresponding fixture or dimmer number of the selected preset scene (A or B). The Grand Master Fader controls all channel master faders. This determines maximum output over the selected scene (A or B). 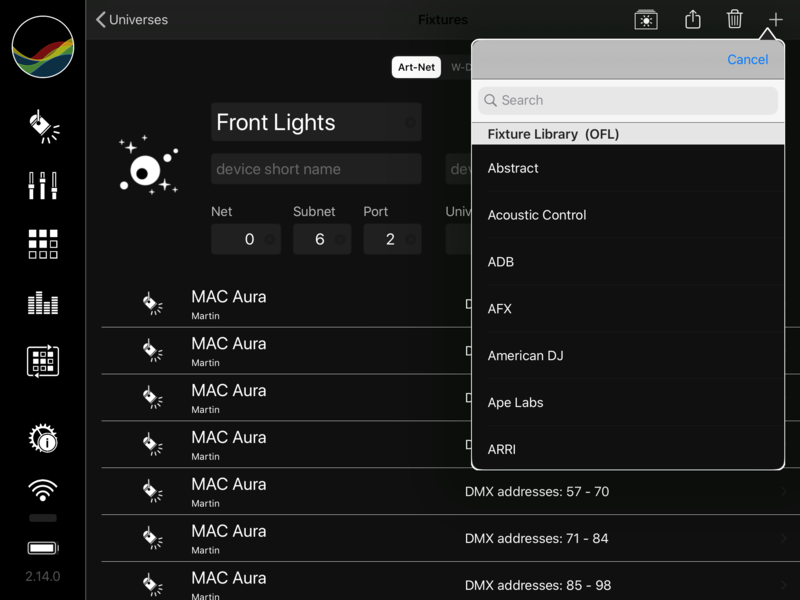 Selects one of the 4 areas of 8 channels (iPad) or 12 channels (iPad Pro). Control channels 25-32/Control channels 37-48. Selects one of the presets (A or B) to modify the fixture settings of a scene. Press this button to momentarily blackout overall output. 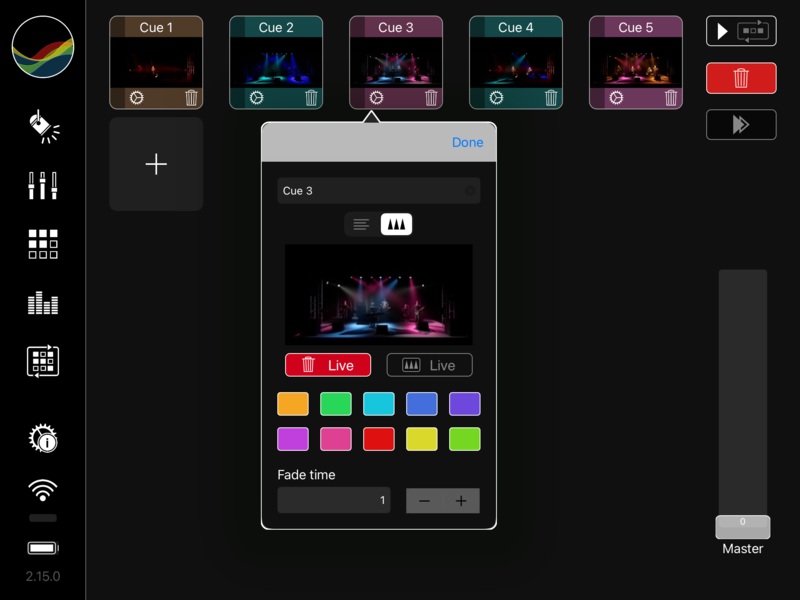 Press this button to Store a stage lighting snapshot as new scene or overwrite an existing. Please see the chapter Working with scenes for more information. To manage fixtures, tap the Fixture Icon Button on the left bar. To add a fixture, tap the Add Button on the upper right side. After that you can see the fixture template view. If you don´t find any suitable template, choose "individual fixture". You can add/assign DMX channels as described below. In both cases you can, if you want, modify the name and enter a label. The label will then be shown in the mixing interface. 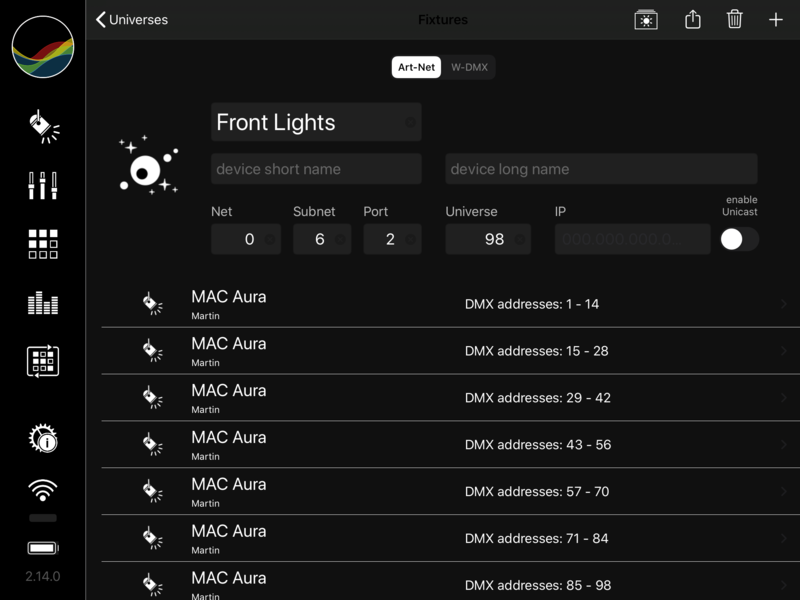 To add a DMX channel to a fixture, tap the Add Button on the upper right side and select one of the types. To remove a DMX channel, swipe left and press Delete. 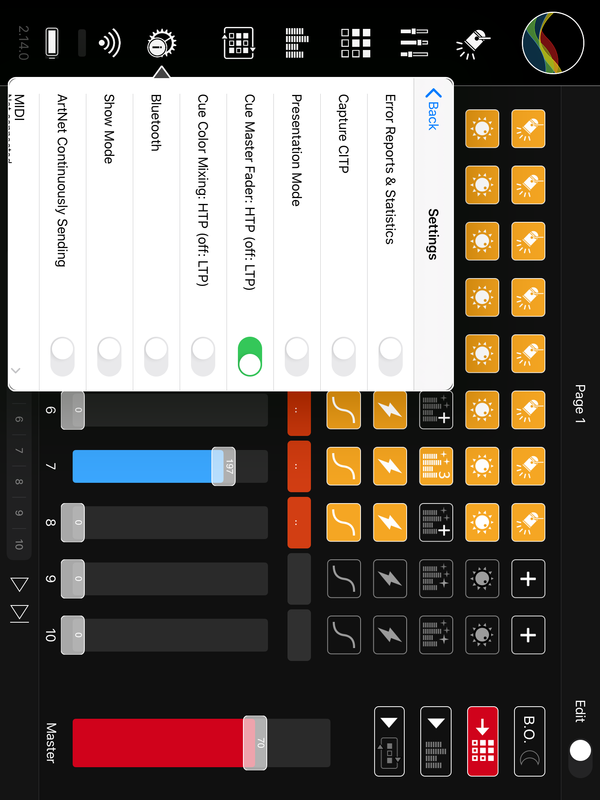 To reorder the DMX channels, tap the Edit Button on the upper right side,then you can reorder the DMX channels bydragging and dropping them. 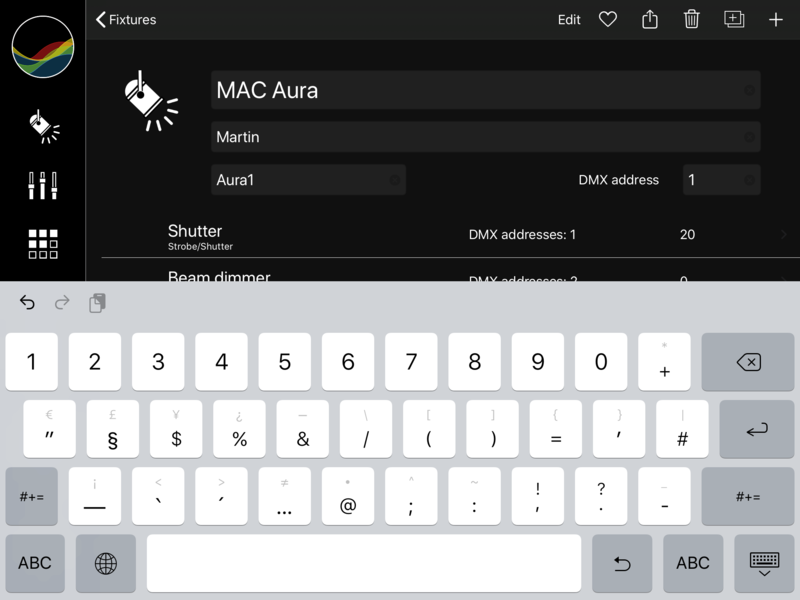 In the edit mode you can also remove a DMX channel, tap the (-) Button and press Delete. To change the DMX channel, tap on the channel and select another one. To add a fixture to your favorite, tap the Favorite (Heart) Button. Favorites will be shown as template in the fixture template view. To clone a fixture, tap on the Clone Button on the upper right side in the fixture details page. To remove a fixture, swipe left and press Delete. You also can remove a selected fixture in the details page or all fixtures with the Delete Button. To manage universes, tap the Fixture Icon Button on the left bar. In case only one universe (default universe) exists, the universe details and the fixture list will be displayed. So tap the <Universe (Back) Button on the upper left side. To add an universe, tap the Add Button on the upper right side. After that you can configure the universe. To remove an universe, swipe left and press Delete. You also can remove all universes with the Delete Button. When you´ve changed the universe the software search automatically the suitable Art-Net node. 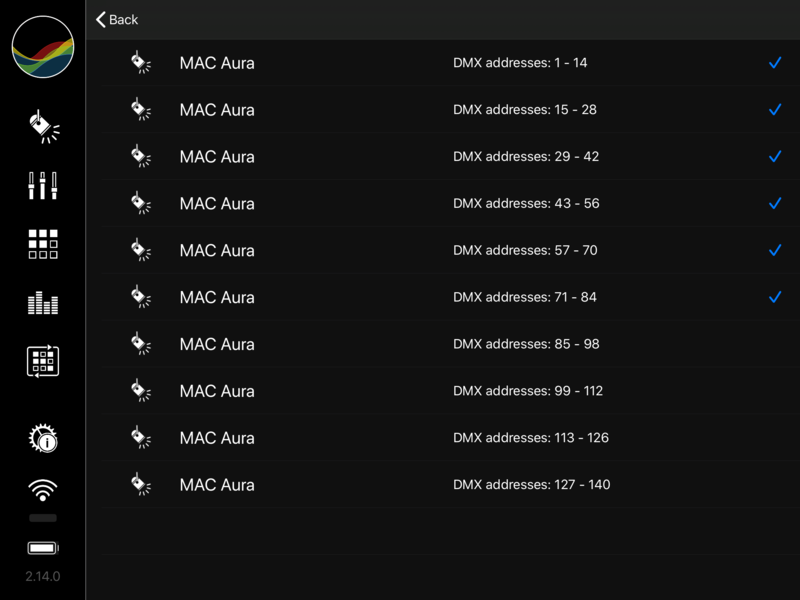 This sets the fields device short name and device long name and overwrites the IP address. The enable Unicast Switch is only active if the text field IP contains a valid IP address. To manage fixture groups, tap Fixture Group Button in the fixture list page. To add a group, tap the Add Button on the upper right side and then enter a name. 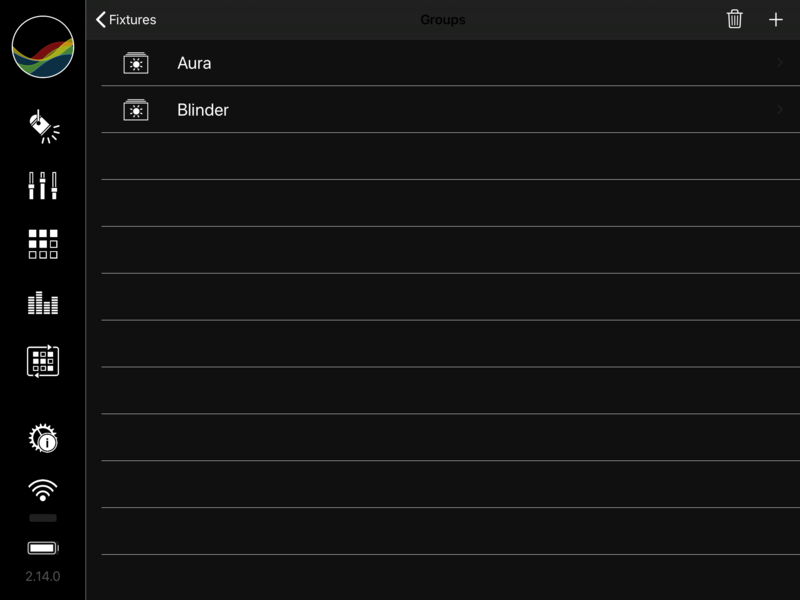 To assign fixtures to a group, tap the Edit Button and select and deselect the fixtures you want in the group. 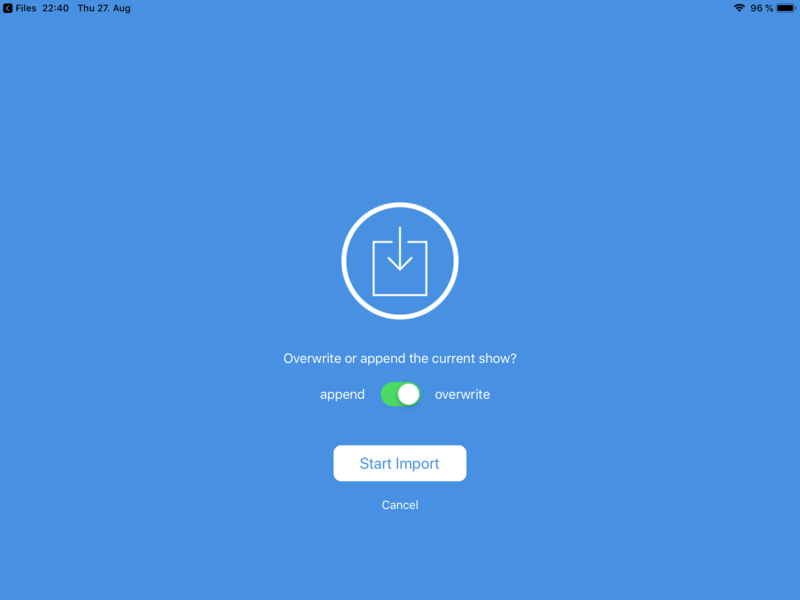 StageLight provides you the ability to export(share) and import your fixture libraries as a JSON File. 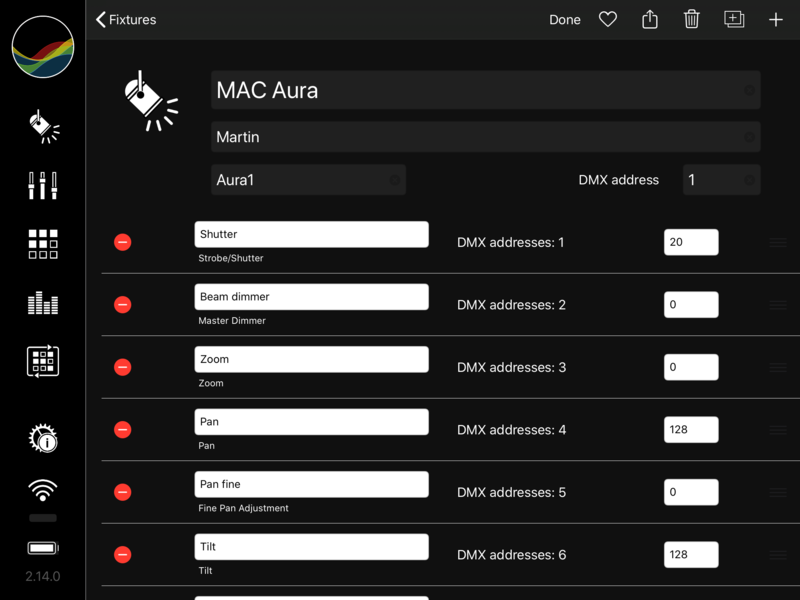 Use Dropbox, Evernote or your prefered application to store different fixture libraries for different stages or share your fixture library with your friends, your colleagues or the StageLight community. To export your configured fixtures, tap on the Share Button on the upper right-hand side and select your prefered application. 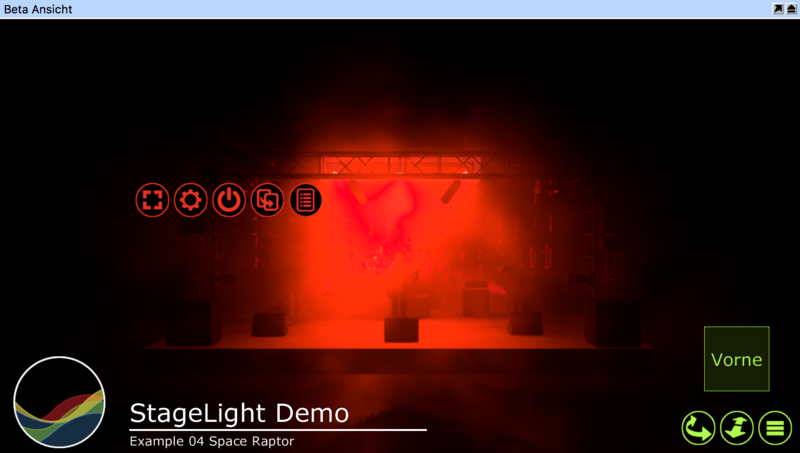 To import a fixture library, tap on the Share in your prefered application and select the StageLight application. Then tap the Start Import Button. You can use your own files or the example of the tutorial session. 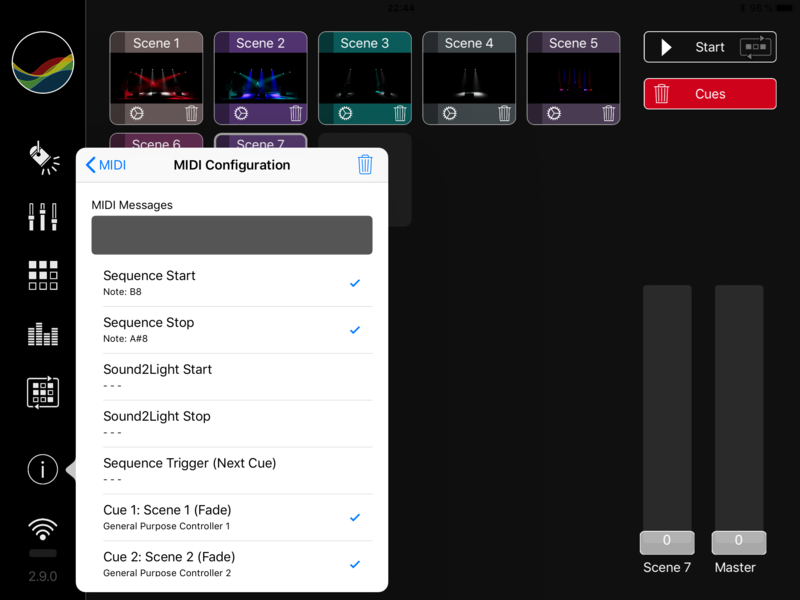 The StageLight app has two identical control banks with 32 (iPad) or 48 (iPad Pro) channels, called scene A or B. The controls on these scenes can be manually adjusted. Each scene has the same number of channels which control the same fixture or dimmers. So you can build a scene offline or in "blind".The A/B Preset Crossfader is used to selectively mix or fade between the different scenes. 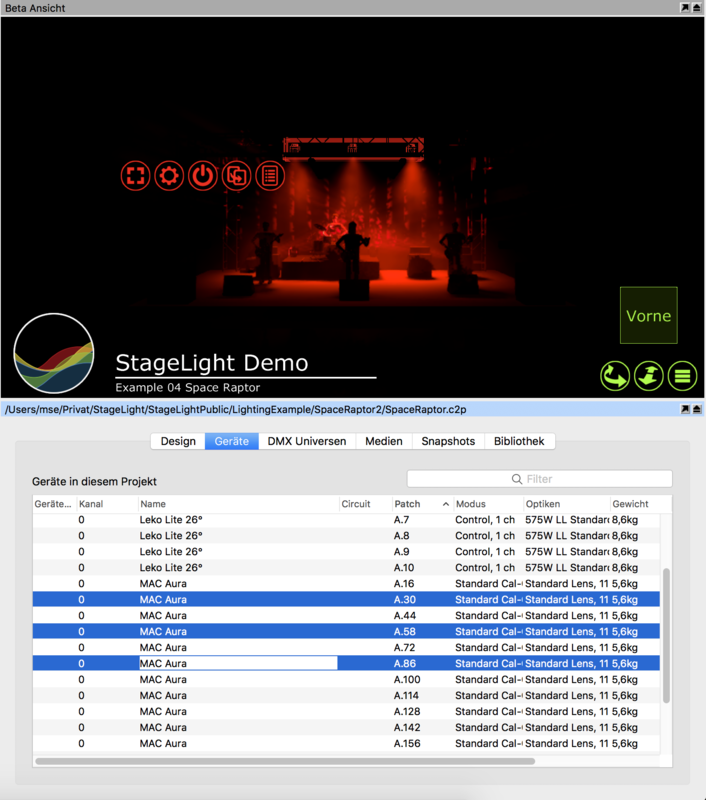 The StageLight App provides the capability to store, manage and play several scenes. Scenes are a snapshot of a lighting setup containing color, master and control values. 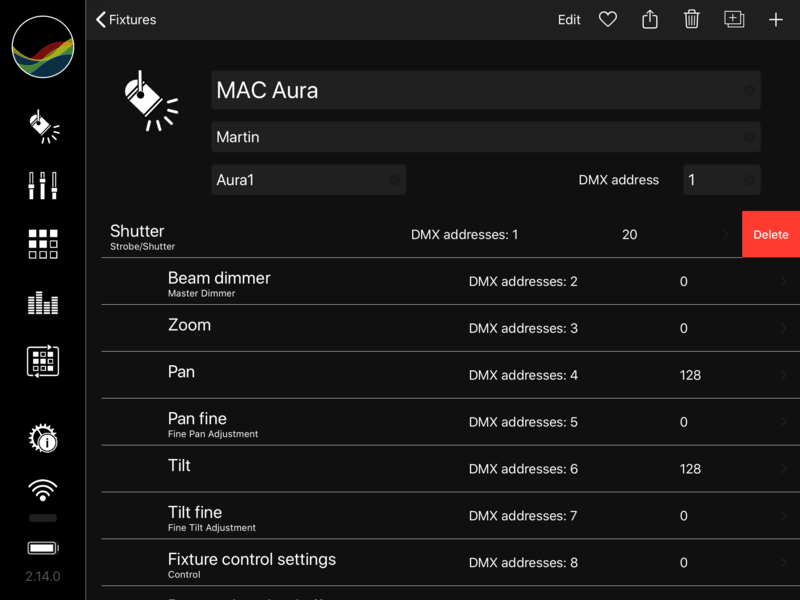 Scenes depend on the current fixture setup (fixture capabilities, dmx addresses and so on). So be careful. If you modify your fixture setup after you have created the scene maybe you can not modify the scenes. 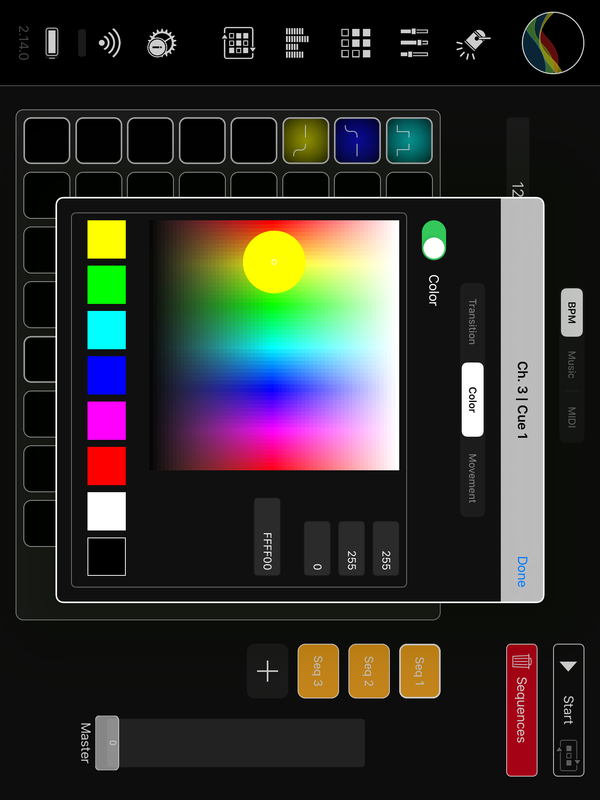 Tap the Store Scene Button in the mixing interface and then the '+' button in the popup dialog. 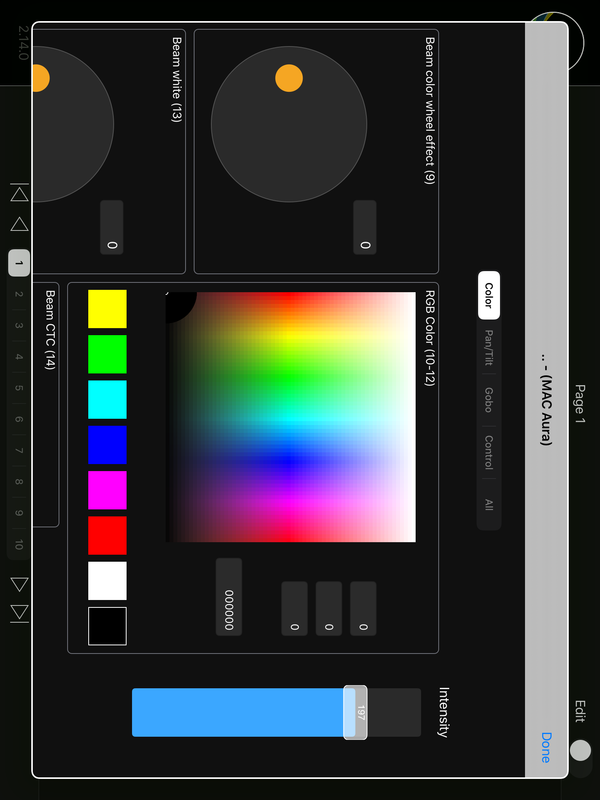 Or tap the '+' button in the scene interface. 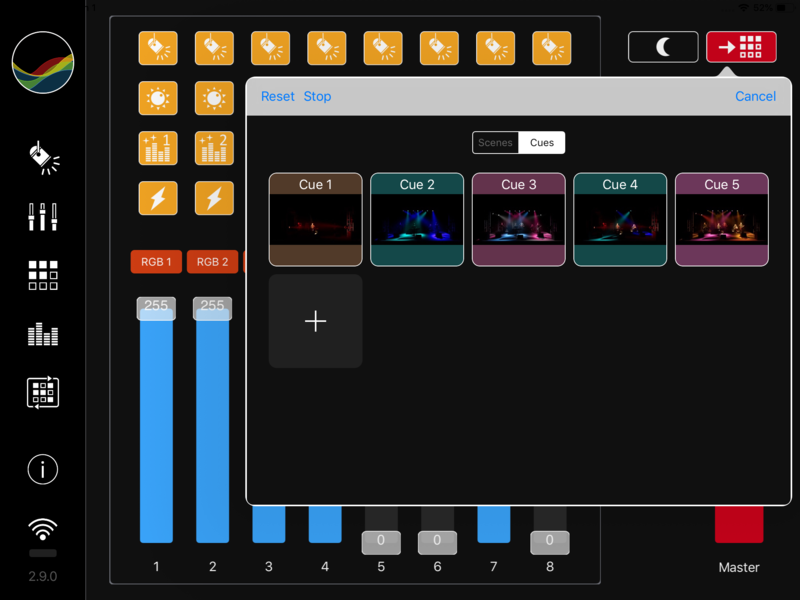 To store a lighting snapshot as a scene tap the Store Scene Button in the mixing interface, then press a scene button of your choice and hold it pressed until it wiggles slightly. To insert or update the scene name, the play script or the look and feel of the scene button, tap the settings icon on a scene button of your choice. To modify a scene snapshot tap the Mixing Button in the scene interface then open the mixing interface on the current active scene. This allows you to modify a scene live or overwrite the source scene or store a new scene. The current scene can be identified by a thicker border and dashed line around the scene button. The next scene has only a thicker border. A double tap on a scene button activates the selected scene -> there is a fast auto crossfade between the old and the new scene. Tap the Next Scene Button to activate and auto fade to the next scene. Tap the Previous Scene Button to activate and auto fade to the previous scene. The scenes are exported and imported together with the fixtures. Please see MANAGE FIXTURES->Import/Export for more details. The StageLight app provides 2 types of effects. For both, you have to assign fixtures or groups in the mixing view to the 8 effect output channels. You don't need to assign fixtures to all channels. 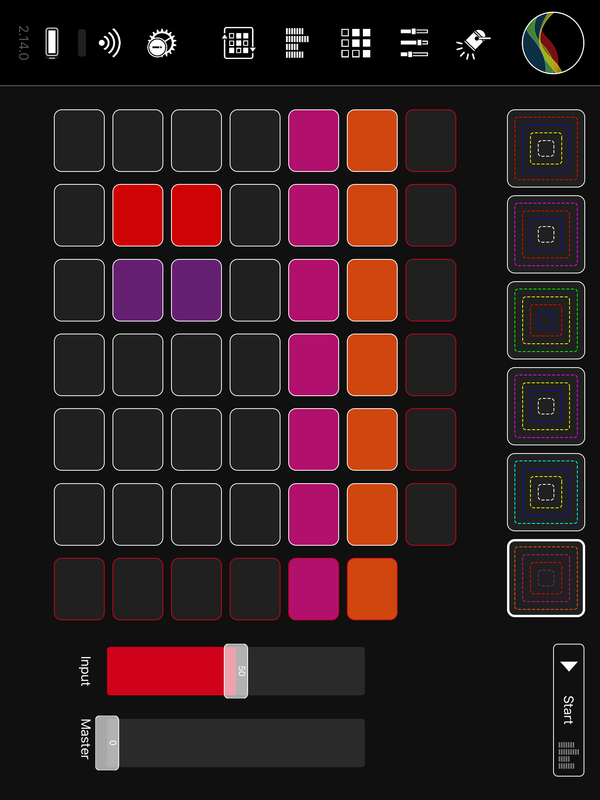 In the sequencer view you can combine multiple cues to a sequence. You can adjust fade-in, fade-out, the color and a movement pattern. Press „Start“ to run the selected sequence. Moods is the new frequency based sound to light effect and replaces the old effect function. Select one of the predefined moods. An effect is characterized by the music-based control of 4 colors. The idea behind it is to have 1-2 base colors to fill a scene and 1-2 colors for effects. Press „Start“ to start the audio effect processing, which requires access to your microphone. 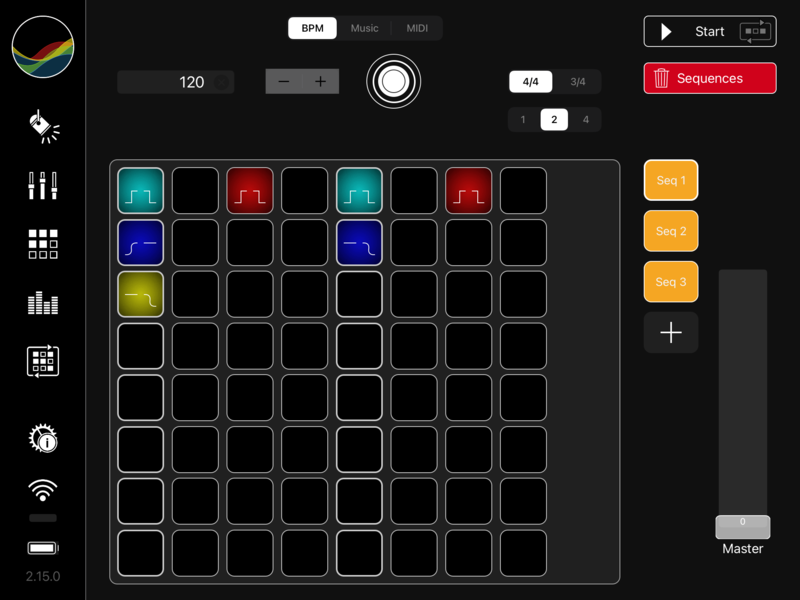 Connect from the StageLight app using the dock connector (Lightning or 30-pin) or a network (RTP-MIDI, also known as AppleMIDI) with the MIDI source. 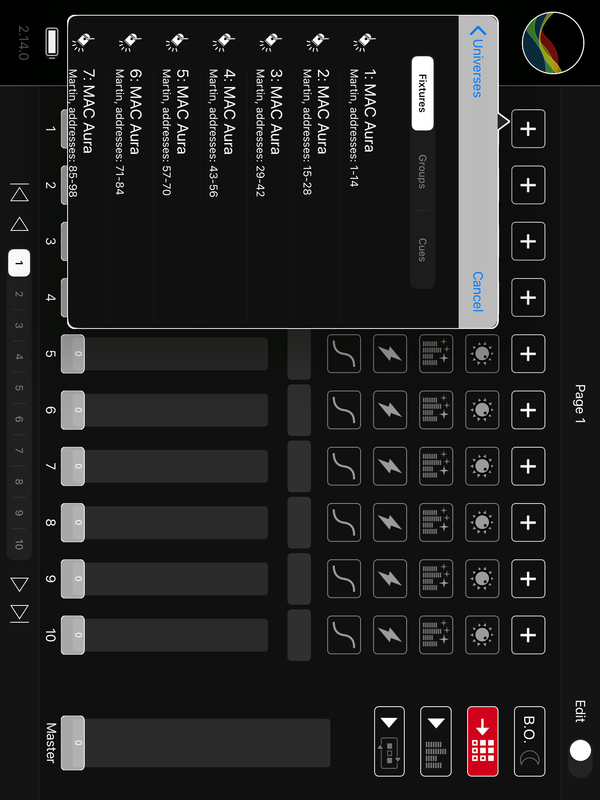 With Apple’s iPad USB Camera Connection Kit you can use a lot of the USB MIDI controllers and interfaces. At first, you have to enable MIDI in StageLight. Therefore switch MIDI in the info/settings popover on and select your connected MIDI device. With the Edit Button, you can configure MIDI messages for the provided actions. With a CITP supporting visualizer (e.g. Capture) you can control a fixture or a set of fixtures. StageLight can receive this protocol messages and store this values as a scene. At first, you have to connect. Therefore enable CITP in the info and settings popover. 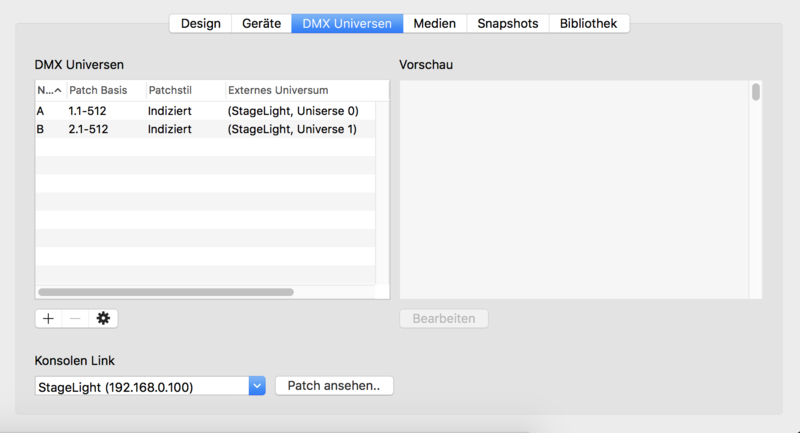 In the Capture DMX view, you can see, the StageLight app is connected with two universes. The universe names are the same as in the app. 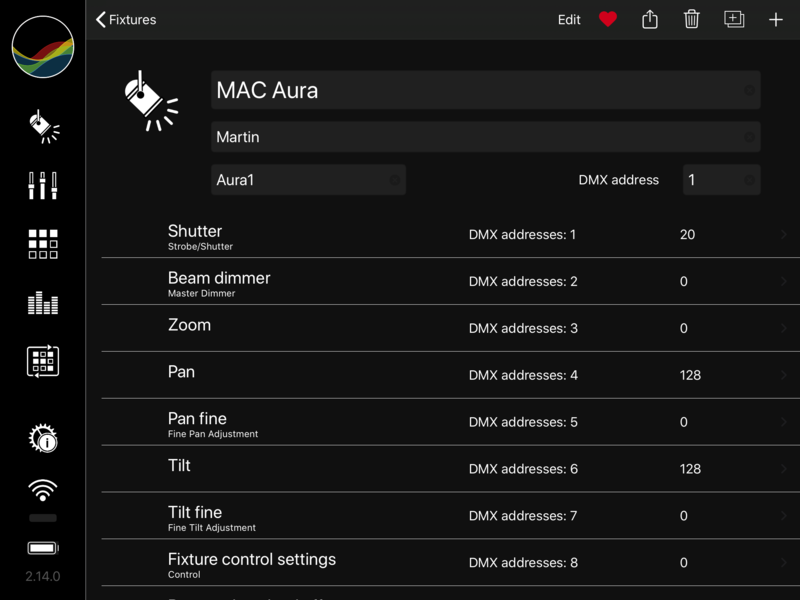 Now you can control the fixtures you want. E.g. focus the selected moving head to a specific point. 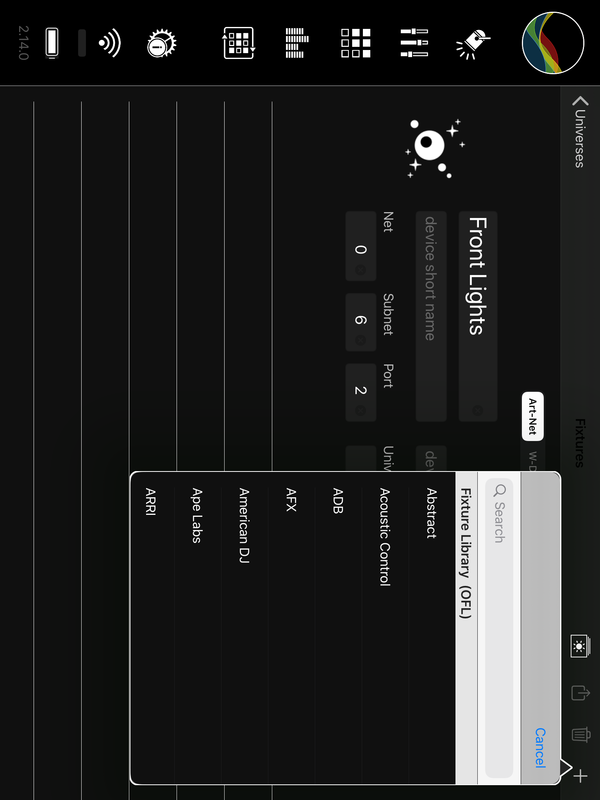 Be ensure that the StageLight app is in the fader section. Now you can store this as scene in the StageLight app in the usual way. Please visit the section "Storing a lighting snapshot as a scene" for that. 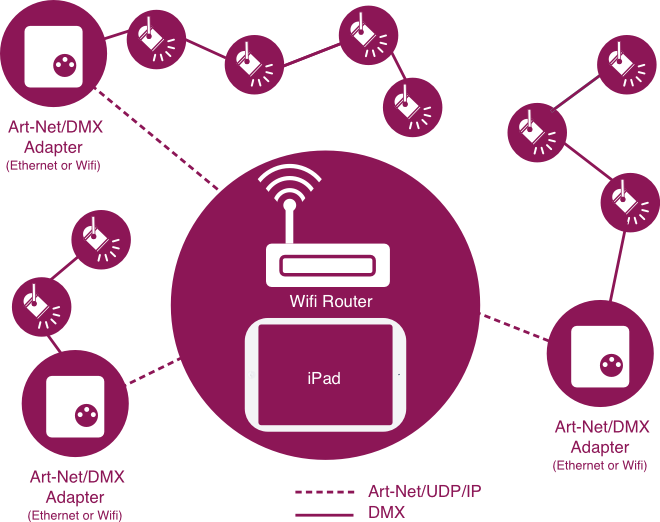 The iPad is connected over WiFi to an Art-Net/DMX adapter (Art-Net node). 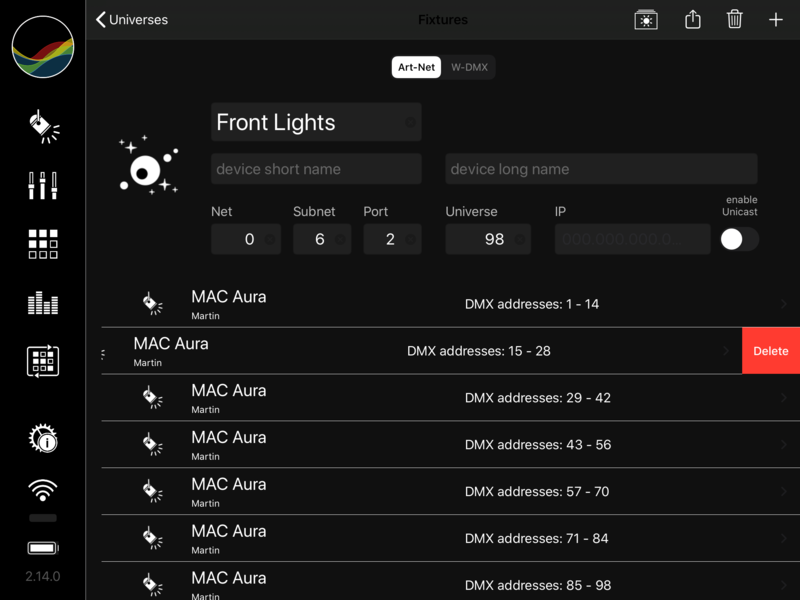 To control the fixtures the StageLight app sends Art-Net UDP packages to the broadcast address (IPV4) of the subnetwork on port:6454. Please ensure that all devices (iPad and n Art-Net/DMX adapters) are in the same subnetwork and no security setting prohibits this communication.